“If God had not performed the miracle, I probably wouldn’t believe in Him today,” Som An says. Pronounce Som An as: sohm ANN. Watch Som An on YouTube. Cambodia Mission has six churches and a membership of 6,719; with a population of 15,797,000, that’s one member for every 2,351 Cambodians. The first Seventh-day Adventist worker to enter Cambodia, then a part of the Indo-China Mission, was Fred L. Pickett, who arrived in January 1930. 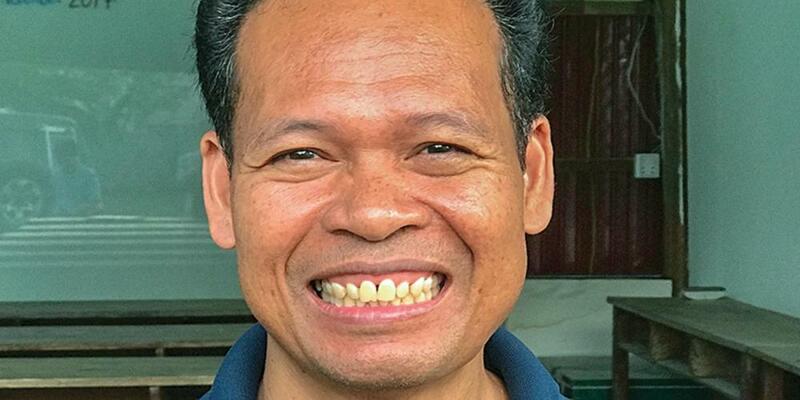 When the government refused to give him permission to build a church, he established a church of 32 Cambodian members at Tinh Bien, a village near Chaudoc, in neighboring Cochin China (now Vietnam). Sorn Som An, an only child raised by a single mother on a farm in Cambodia, started attending church because he hoped to win over a girl. But it took more than a girl for him to break free from family religious tradition. It took the vision of a floating hand. As a teen, Som An followed his girlfriend to her church every Sunday in their hometown of Doun Kaev, located about 45 miles (70 kilometers) south of Cambodia’s capital, Phnom Penh. One Sunday, a Seventh-day Adventist gospel worker spoke to the congregation at the invitation of one of the church’s 30 members. The Adventist’s message intrigued the members, and they invited him to speak again the next week. After the third sermon, the church members unanimously agreed to become Adventist, and they asked Som An to travel to Phnom Penh to inform Adventist leaders about their decision. The 30 church members were later baptized. Som An also was baptized, but he didn’t really believe in God. “I was born into a non-Christian family, and change didn’t come easily,” he said. After his baptism, he moved to Phnom Penh to study at a university. With little money of his own, he asked church leaders for help. He was given the keys to a small one-room house, where he could live rent-free. He tried to get out of bed to kneel, but he collapsed back on the mattress. He tried again to get up, but failed. Mustering all his strength, he finally managed to push himself onto his knees on the third attempt. Som An sank back into bed. At that moment, with his eyes still closed, he saw an outstretched hand and arm appear above his feet. The form appeared to be made of pure light, and it slowly floated from his toes to his knees. As the hand passed over his legs, the fever left that part of his body. Then the hand moved up to his stomach. Whatever the hand passed over was healed. When the hand reached his head, he felt completely well. Today, Som An is 40 and a theology teacher at a private university in Battambang, the second-biggest city in Cambodia. He is active in the local church and readily tells everyone about God’s power. “My heart is so stubborn, like Thomas,” he said, referring to the biblical disciple who refused to believe that Jesus was resurrected until he saw evidence. Part of this quarter’s Thirteenth Sabbath Offering will help construct a community center at Som An’s church. The “center of influence” will feature a medical and dental clinic, a vegetarian restaurant, an organic produce shop, a juice bar, and a fitness center. Thank you for your mission offering.